The project Music and Magic Lantern Slides was inspired by our friendship with historian Michael Zahs and his collection of 19th and 20th-century magic lantern slides. What are magic lantern slides? They are hand-painted glass slides, often encased in a wooden frame, that are projected onto a wall using light from lanterns with a flame fire (acetylene). The process was considered almost magical! [They might be described as the first version of modern power point!] Slide sets told stories, accompanied songs and were used as teaching tools. Magic lantern slides were the first projected images that could move, and therefore were the precursors of motion pictures. 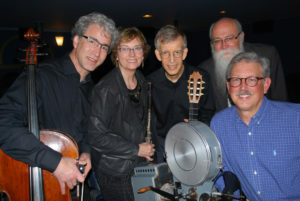 Composers Stephen Cohn, Michael Kimber and Philip Wharton wrote chamber music for three sets of magic lantern slides from the collection of historian Michael Zahs. Each set of slides tells a story that is related to song lyrics, narrative poetry or a short tale. Additional slides were set to arrangements by Jan Boland. 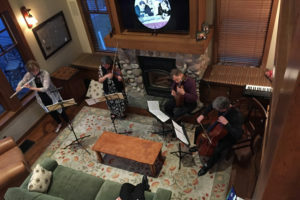 Musicians are flutist Jan Boland, guitarist John Dowdall, violinist Miera Kim and cellist Carey Bostian. Performances included related poetry and lyrics narrated by John Hegarty. The project began in February 2016 and culminated with the official premiere at CSPS on April 30, 2016. Hear the premiere performance of Stephen Cohn’s Curfew on YouTube. John Hegarty (narrator), John Dowdall, Jan Boland, Miera Kim, Mike Zahs, Carey Bostian. Photo by John Richard. Lead sponsors: the Augustine Foundation (NY) __ the Iowa Arts Council. a division of the Iowa Department of Cultural Affairs and the National Endowment for the Arts __ and the McIntyre Foundation. Season sponsor for the 20th-Anniversary Season is CRST International. Carey Bostian (cello), Jan Boland (flute), John Dowdall (guitar), Mike Zahs (historian), John Hegarty (narrator). Stephen Cohn’s works have been performed and recorded by orchestras and chamber music ensembles in the United states and Europe: Arditti Quartet, Kansas City Symph., Prague Philharmonic, Chroma String Quartet, Eclipse Quartet, Palomar, and Midnight Winds. Commissioned works have been performed in Los Angeles, New York, Chicago, Fort Worth, Tempe, Rome, Brussels, Ceret, Passau, Berlin, Orihuela, China and Prague. His works have been favorably reviewed in the LA Times and Huffington Post. He has received an Emmy Award. Recordings are on Warner Bros., Motown, A&M Records, Columbia Records and Albany Records. A former violist of the Kronos Quartet and for twenty years viola professor at the University of Kansas, Michael Kimber currently teaches at Coe College and plays viola in Orchestra Iowa and the Quad City Symphony. His principal viola teacher was Raphael Hillyer, founding violist of the Juilliard String Quartet. Michael began composing music in his teens, gave it up after being seduced from violin to viola, and resumed composing in his forties. 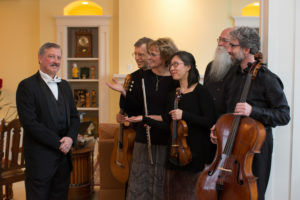 His music, mostly for viola, is widely performed and has been recorded by George Taylor and other artists, including six CDs recorded by Polish violist Marcin Murawskies in Iowa. From symphony to song, Philip Wharton sculpts time. Critics describe his music as “…bold and brash, filled with almost every sound you could imagine” and “decidedly contemporary, both engaging and accessible.” Imagination as muse, he runs wild with rhythm and melody to create new worlds. He was born in New Orleans, grew up in Iowa, studied at Eastman and Juilliard, and now calls New York City home. Recent recordings include his wind quintet and flute sonata, which can be found on iTunes. Recent works include Fools (on Shakespeare texts) and an alto-trombone sonata, both performed throughout the US and Europe. Peter Bloesch (Iowa City, IA) Peter’s Wassail! from his Christmas Suite (2006) was repurposed for this project and was the perfect music behind a set of four black and white Christmas magic lantern slides. Oswald Sonatas: Lovely images of flowers from Michael Zahs’ collection are paired with tiny baroque sonatas. James Oswald (1711-1769), a Scottish composer, wrote fluently in both folk and “high art’ baroque styles, combined both styles in his Airs for the Four Season (published in circa 1755) with good success. These airs were originally scored for flute, violin, and continuo; Jan has arranged them for today’s concert for flute, violin, cello and guitar. Airs for the Four Seasons consist of 48 sonatas divided into four groups — 12 for each season (Summer, Autumn, Winter, Spring). Each sonata is named for a different flower. These tiny sonatas contain from two to four movements, but are very brief — some movements being only eight bars in length. The three sonatas on this concert program are compelling, in part, because of the frequent use of tunes with a distinctive folk flavor, and for the use of folk rhythms (e.g. the scotch snap). The player can easily incorporate traditional Celtic folk ornaments alongside more “proper” 18th-century classical performance style with good effect. Jan found the eighteenth-century edition of Oswald’s Airs for the Four Seasons in the British Library in London. There’s Another Picture in my Mother’s Frame is an example of a 19th-century music publisher marketing a popular song through song slides. We can envision the audience singing along as the slides were shown, although accounts tell us that the song was never a big hit. We felt the images were strong, but the sheet music (by early 20th-c. composer Charles K. Harris) lacking. So we asked our composer Michael Kimber to write a trio for alto flute, cello & guitar ‘influenced by’ the original song. The story reflects the pathos of an earlier time with a child whose mother is to be replaced by a stepmother and now even her mother’s picture is gone from the wall. Next, we asked Michael Kimber to set Herbert Spencer’s popular song Could You Love a Little Girl Like Me, originally for piano and voice, for our instrumental quartet. Quite unlike Harris’s Another Picture, this popular 19th-c song has a lovely melody and creative harmonies. Tonight you’ll hear the lyrics (by John B. Gardner) recited. The heart-on-the-sleeve story, so appropriate to 19th-century sentimentality, is of two young children who became devoted to each other in their youth and grow old together. A set of 9 colorful slides tells the story of The Tiger and the Tub, a fairy tale from India. To our knowledge, this is the first time these 1890 images have had music composed especially for them. How fortuitous that Red Cedar asked composer Philip Wharton to write a work for three instruments; violin, flute and cello – for there are three central figures in the story; Mr. Long, Mr. Short, and the tiger. It seemed to Mr. Wharton appropriate that the longest instrument, the cello, should play long sustained notes and represent Mr. Long. The violin, with an impressive vocabulary of glissando, double-stops, and dissonance possibilities can do great cat imitations, and represents the tiger. The flute, playing playful, short notes, represents Mr. Short. Wassail! from Peter Bloesch’s Christmas Suite, written for Red Cedar Chamber Music in 2005, and the four Christmas-themed magic lantern slides are an excuse to bring back Wassail! off-season. Peter’s music is distinctively Hollywood, and reflects his earlier career as an arranger of music for film scores. Curfew Shall Not Ring Tonight : In 1867, a 16-year old girl named Rose Hartwick Thorpe wrote a poem that would become the most frequently recited in popular elocutions of the 19th-century. Curfew Shall Not Ring Tonight is drawn from a legendary story set in the 17th century. Accounts tell us that Rose’s poem was so frequently recited, that programs would advertise, “Curfew Shall not Ring Tonight will not be recited in tonight’s program!” The central characters in the story depicted in this 12-slide-set are a young girl named Bessie, her finance Basil, and an old Sexton whose job it is to ring the curfew bell each evening. Young Basil is in prison and condemned to die at curfew, but Bessie knew that Oliver Cromwell was soon to arrive on horseback with a pardon for Basil. Fearing that the pardon would not arrive in time, Bessie approached the old, nearly deaf Sexton and begged in vain for him not to ring the curfew bell. In desperation she bravely climbed to the top of the bell tower and grasped the clapper of the bell so that it would not sound. Curfew did not ring that night! Shortly after, Cromwell arrived with the pardon, and the story had an expected happy ending. Our composer, Stephen Cohn has written a powerful work for Red Cedar in reflection of this historic work. The use of repetition sixteenth notes and powerful chords in the lower voices set the stage for the drama as it unfolds. • February, 2016. 4-day residency (16 classrooms) at Johnson STEAM Academy Magnet School, Cedar Rapids, Iowa. • February, 2016. 3-day (12 classrooms) residency at Francis Marion School, Marion, Iowa. • February 27, 2016. (Saturday) at Summit Pointe, Marion, Iowa. • March 17, 2016. Residency day at Lincoln Elementary School, Washington, Iowa. • March 11, 2016. Parlor Concert in Swisher, Iowa. • March 18, 2016. Ainsworth Opera House, Ainsworth, Iowa. • March 20, 2016. for the Triangle Club, Pruecil School of Music, Iowa City,, Iowa. • March 24, 2016. Williamsburg Public Library, Williamsburg, Iowa. • March 24, 2016. Highland Ridge, Williamsburg, Iowa. • March 29, 2016. Cottage Grove Place, Cedar Rapids, Iowa. • March 29, 2016. Calvary Baptist Church, Cedar Rapids, Iowa. • March 31, 2016. Cedar Rapids Public Library, Cedar Rapids, Iowa. • March 31, 2016. Lowe Park Arts Center, Marion, Iowa. • April 3, 2016. House Concert in Cedar Rapids, Iowa. • April 8, 2016. House Concert in Cedar Rapids, Iowa. • April 16, 2016. House Concert in Toddville, Iowa. • April 21, 2016. Marion Public Library, Marion, Iowa. • April 22, 2016. One-day residency at Central City Grade School, Central City, Iowa. • April 22, 2016. Central City Public Library, Central City, Iowa. • April 24, 2016. House Concert in Iowa City, Iowa. • April 27, 2016. Open Rehearsal at Village Place, Marion, Iowa. • April 27, 2016. Village Place, Marion, Iowa. • April 27, 2016. United Church of Monticello, Monticello, Iowa. • April 28, 2016. Kirkwood Community College, Cedar Rapids, Iowa. • April 28, 2016. Vinton Theater, Vinton, Iowa. • April 29, 2016. Meth-Wick Community, Cedar Rapids, Iowa. • April 29, 2016. Sts. Peter & Paul, Solon, Iowa. • April 30, 2016. CSPS Hall, Cedar Rapids, Iowa. • May 1, 2016. State Theater, Washington, Iowa. • May 2, 2016. State Theater, Washington, Iowa. “I love listening to Red Cedar. 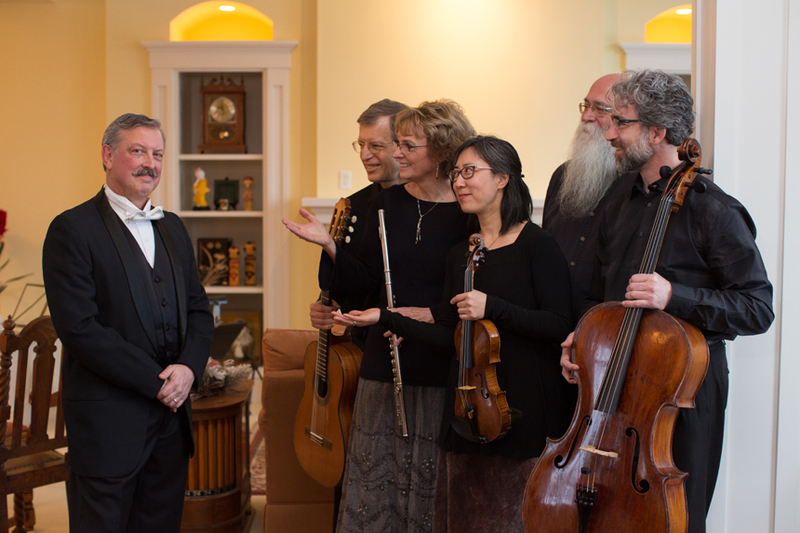 The quality of the musicians is exceptional and the chamber experience is unique and riveting. I also value their work with a variety of audiences and their encouragement of contemporary composers.” M.B. “I am impressed by Red Cedar’s willingness to use their substantial talents and invest so much time and effort as they serve small audiences in humble venues. Their passion to share great music with all kinds of people is inspiring.” M.F. “I saw how affecting the presentation was – people laughing, pondering silently, even shedding a few tears at the poignancy of the childhood pieces. A real treasure! Red Cedar continues to do itself and its audiences proud.” E.M.
“Lovely setting and acoustics. Brilliant playing. The musicians are world-class quality.” A.B. “Loved how the instruments spoke to each other. Pure enjoyment.” D.M. “They are a gem of chamber music excellence and passion who have carved out a unique and prominent artistic profile in Iowa.” S.C. M. “Wow!! It’s so moving!! I was literally moved to tears. I had no idea that it would be so powerful and moving in performance. The story took on a whole dimension with this reading and with the last verse which adds so much… and the Finale seems so much more meaningful with it . . . but mostly because of such passionate playing by the ensemble – really gorgeous, expressive playing, full of heart and energy! The music and poetry really feel organically connected. It was a thrill to hear my music so beautifully and passionately performed.” Stephen Cohn, composer. “I have never seen an audience so moved by a performance of my work which, I believe, was triggered by the brilliance of Red Cedars performance and the drama of the poem as well as the composition.” Stephen Cohn, composer. Red Cedar Chamber Music house concert. Note the projected Magic Lantern Slide image over the fireplace.